Every once in awhile, a book comes along that you want to share with the whole world for one reason or another. Until Tuesday is that kind of book. A highly decorated seventeen-year veteran returned from his second tour of Iraq with serious physical wounds that ended the career he had trained so hard for and had poured so much of himself into, heart, soul and body. But even more crippling was the post traumatic stress disorder that even former Captain Luis Carlos Montalván and those he loved and trusted most didn’t fully understand or accept. Simply coping with a short trip to the corner deli to purchase a sandwich was a journey filled with landmines that threatened to bury him in a morass of migraine pain and overwhelming paranoia. Navigating the tortuous labyrinth to obtain treatment through the VA was a struggle on every level. The trip to get to the VA or to school on public transportation was often more than this wounded soldier could manage. Life and all hope for the future seemed pretty bleak for Captain Montalván. Until Tuesday. 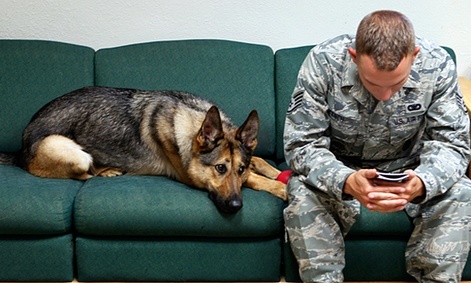 In the last few decades, our military and medical fields have begun to accept the insidious and debilitating realities of PTSD and seek remedies, but it is fairly recently that the amazing healing power of a properly trained service dog has come on the scene. There is still an enormous amount of work to be done in educating, not just the medical field and the military, but the general public. 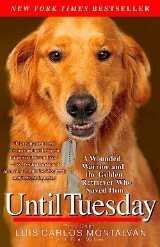 Beyond being a fantastic read and a heartwarming story, UNTIL TUESDAY should be required reading for every American until we, as a society, understand the cost our young men and women will pay when we send them into harm’s way, and until acceptance of these warriors and the dogs that are saving their lives is universal. God bless the men and women who have given so much and suffer unspeakably and BRAVO for the growing numbers of special people who understand the difference a canine can make. People like Montalván’s Lu Picard, founder and director of Educated Canines Assisting with Disabilities (ECAD), K9s for Warriors and others. Until Tuesday was part of the inspiration for book two in my Camerons of Tide's Way series, LOVING MEG. Meg, like Capt. Montalván, has returned from a year in a war zone. She is physically whole, but her soul has suffered. She's coping with survivor's guilt and trying to find her way to fit back into her civilian life and feeling like no one, not even her loving husband, can fully understand. Then she meets Kip. 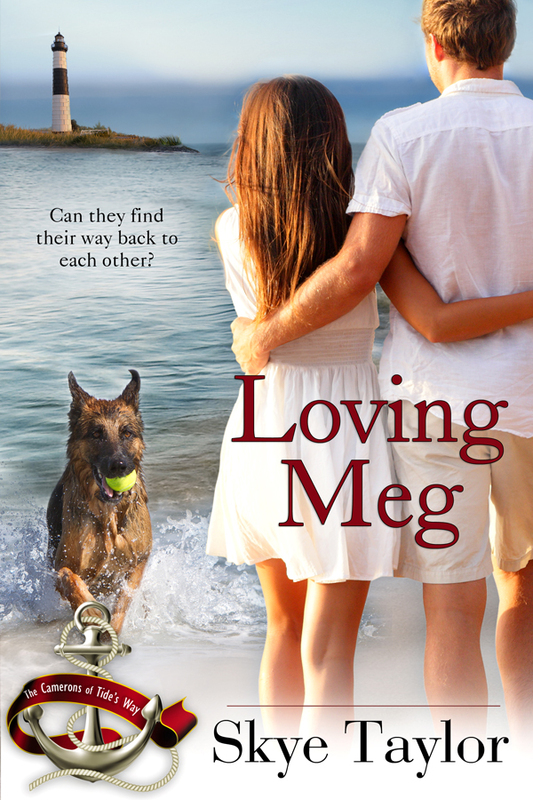 Another survivor grieving for a lost partner, Kip worms his way into Meg's heart and teaches her to trust him. Available at Amazon, B&N, Kobo, iBooks and Google Play. All royalties for this book are donated to the K9s For Warriors program. This Month's Round Robin Blog Hop Topic: Secondary characters have many functions in stories. Have you ever had a secondary character surprise you in some way? How? How about in other author's books that you've read? Do you have a favorite secondary character in either your own work or in books you have read? Secondary characters are important in so many ways. Among other things, they can add comic relief or get away with saying things that need to be said but the main characters can’t think them. Secondary characters provide depth to the story and to the main characters depending on the way the main characters react to them or rely on them. Years ago, my dad always watched Perry Mason (the original Perry Mason series) and he always marveled at how clever Perry was to ferret out the truth of who done it in spite of Lt. Tragg’s and Hamilton Burger’s assurance that they had the bad guy. But where would Perry have been without Paul Drake? Paul was the one who always came through with that illusive bit of information Perry needed to prove his client innocent. To me, Perry Mason would not have been the same character without his faithful sidekick Drake, or Della Street, the woman who always had his back. In a newer series of novels, Murder on Edisto and Edisto Jinx by C. Hope Clark has included a whole cast of colorful characters, including Sophie the Psychic, who give depth not just to the story and the setting, but also are foils to her main character, Callie Morgan. 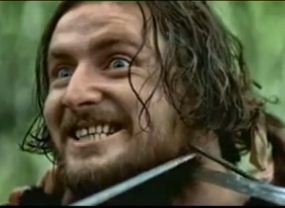 And what would the movie Braveheart have been without the Mad Irishman, Stephen who claimed ownership of the whole Island of Ireland and a direct line to God? Years ago, I read a book where the hero was an author who argued constantly with his main character. He, the author hero, wanted one thing and his hero character wanted something else. The author character would put his hero a heartbeat away from bedding the woman he desperately desired, then yank the rug out from under him and the would be seducer would scream in frustration. I often wonder how often both of these characters surprised the woman who wrote the novel. In one of my historical novels, I gave my hero a sidekick who was his closest friend and business partner. But somewhere along the line the friend fell in love with the heroine meant for my main character. My first thought was, “Houston, we have a problem!” That was not what he’d been put into the story to do. But then I decided to just go with it and see where it led. By the end of the book, when the hero and heroine had overcome all their conflicts, it was clear that my lovesick secondary guy needed his own love interest, and of course, his own story, which I began writing at once. In the 4th book of my current series, which will be out this July, I have a secondary character who I thought I knew really well, but she did something I had never anticipated. And even then, once I accepted that twist, she did another about face. She was a teenager and teenagers are known to be filled with drama and angst, but still, I was surprised. 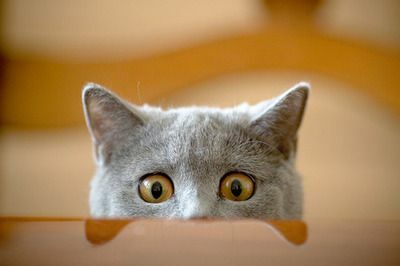 In considering the question of secondary characters who might surprise their authors, I wondered if those surprises come because the author is what we call a “Pantser”. A Plotter carefully outlines their books before they start writing so perhaps they never have surprises. But I write character driven stories by the seat of my pants. I’m a Pantser. I create my characters with detailed backstories. I interview my characters and ask difficult questions about how they feel about things before I begin to write. Then I just plop them into the situation I’ve set up for them and let them react. Maybe that’s why my characters so often surprise me. But here are a few other authors willing to share their thoughts on secondary characters and surprises. Check them out. Tired of today’s partisan bickering already? 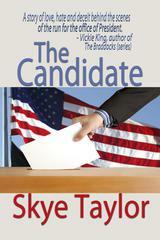 Escape into THE CANDIDATE it’s a campaign rollercoaster you’ll love. In one reviewer's words: "reminiscent of John Grisham." It’s down to the last two months in a neck-and-neck presidential election race. Matt Steele is trying to run a clean and honest campaign, while not alienating his party base with details of the harsh economic realities he knows he will have to embrace if he wants to restore the American dream. While campaigning, he is slipped an old snapshot by an Amerasian immigrant who claims to be the son of Matt’s closest friend who was killed in Vietnam. Matt’s acceptance of this man and his claim erupts into allegations that the young man is Matt’s illegitimate son, something neither Matt nor his adversaries believe. But the photograph also triggers buried memories, and old guilt about the woman in the picture and the promises Matt made to her after his friend was killed. Rolly Miller, a charismatic man with a reputation for turning his state around is ahead in the polls. He wants to maintain his public image as a grieving widower and keep his long time lover a secret until after he has won the election. Blair Cabot is an outsider who is determined to bury his opponents whatever it takes, including arm-twisting, blackmail, and lies. But Cabot’s past includes some very shady shipping deals and three men who may have died to keep them quiet. How will the candidates manage to keep their pasts buried as November approaches and the margins in the polls get even narrower? Or will all the ugly secrets get bared and change the outcome of the election? For Matt Steele, the photo shoved at him during a rally, took him off guard, jerking him back to a time he’d done everything to forget, to emotions he never wanted to relive. In the midst of this hotly contested race for the White House, the photo and the man who brought it to him will challenge everything Matt thought he knew about himself. Rolly is a decent guy just trying to get past the election before he comes clean about his personal life, but when one of his opponents gets nasty, his lover launches a Twitter campaign filled with half truths and innuendo to bring the other candidate down. The outcome is anyone’s guess, or perhaps one man’s worst nightmare coming true. Twitter: POLBRAT: Col Cabot – What’s w arms smuggling? Isn’t that treason? “Colonel Cabot?” Blair glanced up, a blank look of incomprehension on his face. “This Colonel Cabot!” TJ slapped a sheaf of computer printouts on Blair’s desk. Blair went suddenly ashen, and TJ felt the shock of that involuntary admission clear down to his toes. He’d been so sure this whole Twitter thing had been a hoax. “There are no colonels connected with Cabot Industries. And Bill Candace did commit suicide. Blair stood, clearly pulling himself together and trying to get a handle on things.